Today, weddings have become more and more about reflecting the personal style and taste of the couple rather than sticking to wedding traditions for the simple fact that they are traditions. Many wedding traditions have run their course and are no longer expected or required, which allows you and your sweetie to pick and choose, and even create, your very own wedding day festivities for a truly special and unforgettable day. When it comes to planning a wedding, check out these old wedding traditions that got a make-over and are now the new wedding traditions. 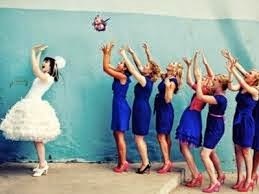 Many modern brides are skipping the bouquet toss all together because their single friends aren’t always excited to participate. Instead, make all your best girlfriends, single or attached, feel the love with a special toast or personalized notes. Bonus: you get to keep your bouquet. This is one tradition that will probably stick around until the end of days, but if a traditional white or ivory wedding gown just doesn’t appeal to you, try a champagne or blush (or any other color dress your heart desires) dress. Want to stick with the traditional white gown? You can still have fun with it and make it truly your own by adding a pop of color with a sash, piece of jewelry, or shoes. The problem with not seeing each other until the ceremony is that you leave your guests waiting for a long time after the “I Dos” while you take pictures. Many couples are now scheduling a “first look” photo shoot where it’s just the bride, the groom and the photographer. This way, you won’t feel rushed during your photo shoot, you get your pictures taken while your hair and makeup is still fresh and perfect, and your guests won’t get antsy waiting for the reception to kick off. If your best friend happens to be a man, don’t feel like you can’t ask him to stand with you while you say “I Do”. Bridesmaids and groomsmen are no longer confined to the separate sexes. Traditionally, the bride and groom are sent off on their honeymoon in a shower of rice leaving the wedding guests to close out the night. More often, couples are dancing the night away, staying right until the end of the night and saying goodbye to guests and making sure everyone gets home safely. If you’re not a couple that goes to church, it may not make much sense to get married in one. Many couples have steered towards having a backyard wedding, or having the wedding at a place that holds special meaning to them. An outdoor, non-church wedding not only lends a more relaxed feel, it can help save you a lot of money as getting married in a church can often carry a hefty price tag. If you have enough spatulas, cookware, and cutting boards to last you a lifetime already, skip registering for these traditional items. Today, there are plenty of registry options you and your sweetie can choose from that will be much more valuable than pot holders. Universal registries allow a couple to create a master registry of products from a wide variety of stores and websites. Honeymoon registries are super cool in that they let guests provide upgrades or activity-based gifts for the couple on their honeymoon. About the Author: Lovie Art Jewelry specializes in affordable wedding jewelry so that every couple can wear the wedding rings they deserve – regardless of budget.